Today we decided to drive up to the mouth of the canyon and ride from there so we could go further up the canyon. Without the 2 miles each way on the road the average speed goes down but the workout is every bit as demanding. 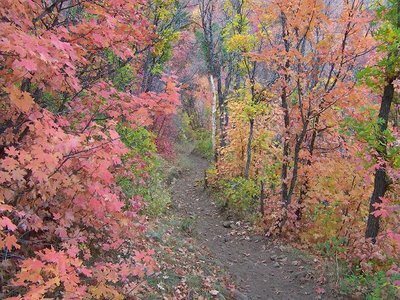 We now have enough pictures of the fall colors from the last few days to supply this blog with images for the rest of the year. We met a man today who was walking up the canyon. I think I have seen him before, but today we kind of leap frogged back and forth climbing the canyon, so we talked a bit with him. He was suggesting a lot of nice places to ride mountain bikes, everything from Peru, to AF canyon. He said he didn't mind bikes but hated motorized vehicles. Then awhile later he started cursing all of the cars on the Wasatch Front. "They're a scourge!" He has a point, but it sure is nice that we have somewhere close we can go and escape the motors of our world.